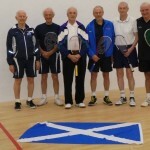 For the first time ever, in the Home Internationals, there was an Over 75s category, which was a great occasion, but did pose a few logistical problems with match scheduling, since two of the Over 75s team were also members of the Over 70s team. On the Friday night, the Over 70s first match was v the host country, Ireland. Andrew Rugg-Gunn recorded an exciting 3/2 win over the Irish number 4, after being match ball down in the third game. Vinnie Taylor looked like a winner when 2 games up against the Irish number 2, but eventually narrowly lost 2/3 (a tough match, especially as Vinnie had already played in an Over 75s match earlier that same evening!). Ken Reid and Bill Kennedy, at 1 and 3, both managed to win just 1 game each, and Angus Mackay, lacking much mobility, due to a problem with his knee, lost 0-3 at 5. Thus, we lost 1-4 to Ireland. The first match on the Saturday morning was v Wales, and although Ken Reid (3-0) and Vinnie Taylor (3-0) won, at 1 and 2, we were unfortunately unable to pick up any more games at 3, 4 and 5, so a 2-3 loss, to Wales, was recorded. The second match on Saturday was v England, by far the strongest team in the group and led by the current Over 70s World Champion Adrian Wright, so, not too surprisingly, we went down 0-5, to England. Although Scotland finished 4th, more points were gained overall (13) than in any of last three years, and the match v Wales (who finished in 2nd position, after England) was very close. The Over 75s team, of three players, had two matches (Wales did not enter a team), the first match v Ireland, on the Friday night, was lost 0-3. However, Vinnie Taylor put in a sterling performance, going 2 games up, but then eventually losing 2-3 to the very strong Irish number 1,Mike Collins. Bill Kennedy was unlucky to lose 0-3, with each game being extremely close, and decided by I or 2, crucial, points. Andy Jack, the oldest member in the Scottish team, at 83, put in a good performance, but lost 0-3 to the Irish number 3. On the Saturday afternoon, the team played and lost (0-3) to an exceptionally strong England side, the overall winners. Special mention must be made of Vinnie Taylor’s and Bill Kennedy’s contributions over the weekend, since playing in both the Over 70s and Over 75s matches, they each clocked up 5 matches in around 24 hours. 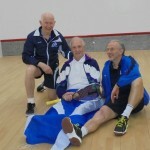 That, along with Andy, at 83, playing in the team, is an excellent example of the great spirit shown by the Scottish team, in these first ever Over 75s Home International matches. The weekend was nicely rounded off, on the Saturday night, by an excellent dinner, held at the Fitzwilliam Club, where all the Scottish players could celebrate the fact that the Scottish Women’s Over 50s team had a very exciting narrow victory over the English team, to become overall winners, and that the Scottish Men’s Over 50s came a good second, behind England, in their age groups. Thus the old men hope that they will be able to match the youngsters’ performances, at next year’s Home Internationals, to be held at Nottingham on 8-9 May 2015.